Sometimes, when I’m driving around, my heart is filled with scorn. Scorn for bad vanity plates. Scorn for fake, stick-on hood vents from AutoZone. Scorn for cheap, aftermarket aero bits that do nothing. But here’s the thing: when the big and dumb wing comes stock, then I love it. There’s just something so lighthearted and carefree about them. I’m not talking about the folding wings, like on a standard Jaguar F-Type, either. I’m talking about the big, fixed ones that you can’t hide from the cops. I see them as a kind of rebellion from the button-down look that sells cars to the mainstream public. 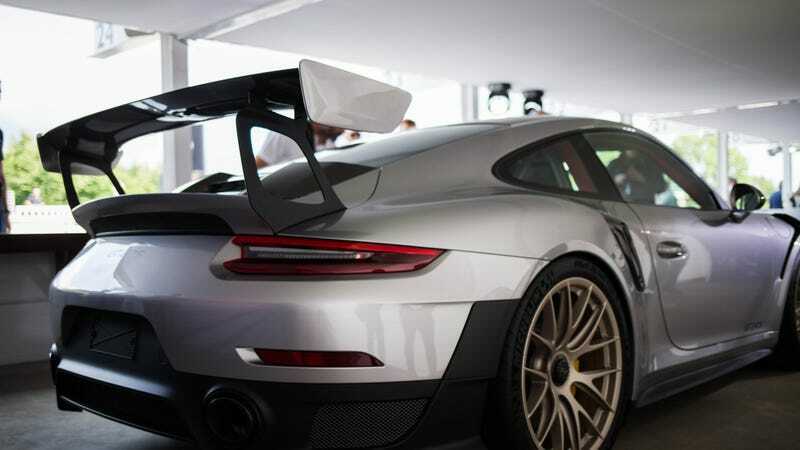 Most car buyers see a big wing and they go, “Oh, that looks too boy-racer.” And they move on. That’s a fine opinion to have. Most of the time, I agree with you. I agree that day-to-day cars shouldn’t be terribly gaudy. If it’s going to have some cool detailing, it should always be done in a tasteful manner. A single stripe here. Maybe an aggressive diffuser there. Canards? Usually better if left off. But all of that goes out the window when it comes to stock wings. The wing almost always comes on cars that are fun! Does the boxy spoiler on the trunk of a Subaru WRX STI provide actual downforce in actual situations that the driver will actually use it for? Probably not! Do wings throw off the aesthetic flow that the rest of the car has going on? Most likely! But do they make me giggle at their ostentatious silliness every single time? You goddamn bet they do. Therefore, in my eyes, they have done their job. The one on the back of a Mitsubishi Lancer Evolution X is one of my favorites. The car’s rear is ugly and square, so they put a square wing on the trunk. Genius! It totally blocks your rear-ward vision but who cares! It’s obnoxious and got some attitude, just like the car. A Nissan GT-R also has a cool wing. I always thought it looked like a piece of folded carbon fiber. The fact that the colors contrast is also a good thing. When we start getting into stuff like Porsche RS models, it gets a little serious. But, I think that’s more so the people who generally buy, drive and talk about RS models. Those people are very serious. The wings themselves are wonderful: carbon-fiber weave sparkling in the light, held aloft by skeletal stands like a mechanical altar to some unnamed downforce god. Yes, I’ve seen pictures of those three- and four-tiered wings and I think they are just as dumb as you think they are. Because they’re aftermarket. OEM, though... definitely yes.